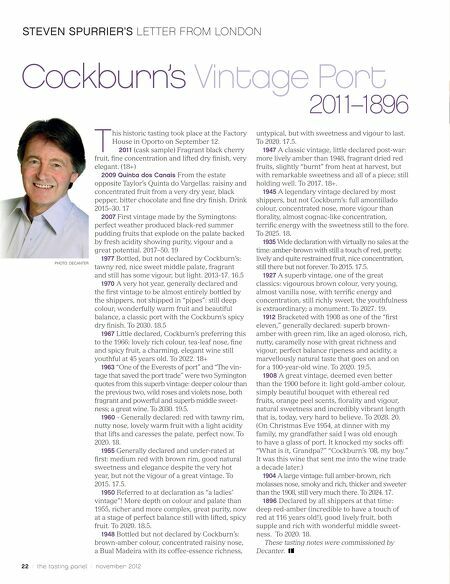 STEVEN SPURRIER'S LETTER FROM LONDON Cockburn' T PHOTO: DECANTER s Vintage Port 2011–1896 his historic tasting took place at the Factory House in Oporto on September 12. 2011 (cask sample) Fragrant black cherry fruit, fine concentration and lifted dry finish, very elegant. (18+) 2009 Quinta dos Canais From the estate opposite Taylor's Quinta do Vargellas: raisiny and concentrated fruit from a very dry year, black pepper, bitter chocolate and fine dry finish. Drink 2015–30. 17 2007 First vintage made by the Symingtons: perfect weather produced black-red summer pudding fruits that explode on the palate backed by fresh acidity showing purity, vigour and a great potential. 2017–50. 19 1977 Bottled, but not declared by Cockburn's: tawny red, nice sweet middle palate, fragrant and still has some vigour, but light. 2013-17. 16.5 1970 A very hot year, generally declared and the first vintage to be almost entirely bottled by the shippers, not shipped in "pipes": still deep colour, wonderfully warm fruit and beautiful balance, a classic port with the Cockburn's spicy dry finish. To 2030. 18.5 1967 Little declared, Cockburn's preferring this to the 1966: lovely rich colour, tea-leaf nose, fine and spicy fruit, a charming, elegant wine still youthful at 45 years old. To 2022. 18+ 1963 "One of the Everests of port" and "The vin- tage that saved the port trade" were two Symington quotes from this superb vintage: deeper colour than the previous two, wild roses and violets nose, both fragrant and powerful and superb middle sweet- ness; a great wine. To 2030. 19.5. 1960 - Generally declared: red with tawny rim, nutty nose, lovely warm fruit with a light acidity that lifts and caresses the palate, perfect now. To 2020. 18. 1955 Generally declared and under-rated at first: medium red with brown rim, good natural sweetness and elegance despite the very hot year, but not the vigour of a great vintage. To 2015. 17.5. 1950 Referred to at declaration as "a ladies' vintage"! More depth on colour and palate than 1955, richer and more complex, great purity, now at a stage of perfect balance still with lifted, spicy fruit. To 2020. 18.5. 1948 Bottled but not declared by Cockburn's: brown-amber colour, concentrated raisiny nose, a Bual Madeira with its coffee-essence richness, 22 / the tasting panel / november 2012 untypical, but with sweetness and vigour to last. To 2020. 17.5. 1947 A classic vintage, little declared post-war: more lively amber than 1948, fragrant dried red fruits, slightly "burnt" from heat at harvest, but with remarkable sweetness and all of a piece; still holding well. To 2017. 18+. 1945 A legendary vintage declared by most shippers, but not Cockburn's: full amontillado colour, concentrated nose, more vigour than florality, almost cognac-like concentration, terrific energy with the sweetness still to the fore. To 2025. 18. 1935 Wide declaration with virtually no sales at the time: amber-brown with still a touch of red, pretty, lively and quite restrained fruit, nice concentration, still there but not forever. To 2015. 17.5. 1927 A superb vintage, one of the great classics: vigourous brown colour, very young, almost vanilla nose, with terrific energy and concentration, still richly sweet, the youthfulness is extraordinary; a monument. To 2027. 19. 1912 Bracketed with 1908 as one of the "first eleven," generally declared: superb brown- amber with green rim, like an aged oloroso, rich, nutty, caramelly nose with great richness and vigour, perfect balance ripeness and acidity, a marvellously natural taste that goes on and on for a 100-year-old wine. To 2020. 19.5. 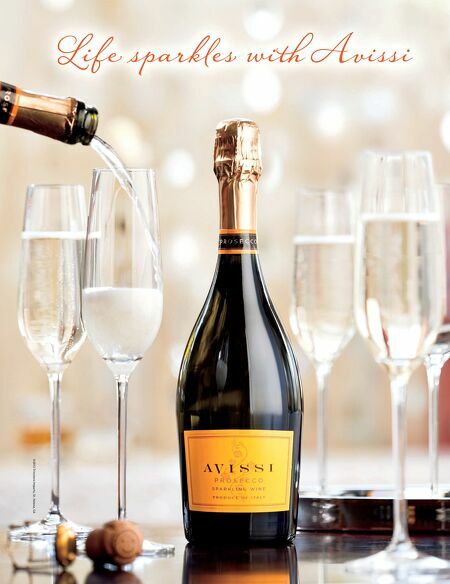 1908 A great vintage, deemed even better than the 1900 before it: light gold-amber colour, simply beautiful bouquet with ethereal red fruits, orange peel scents, florality and vigour, natural sweetness and incredibly vibrant length that is, today, very hard to believe. To 2028. 20. (On Christmas Eve 1954, at dinner with my family, my grandfather said I was old enough to have a glass of port. It knocked my socks off: "What is it, Grandpa?" "Cockburn's '08, my boy." It was this wine that sent me into the wine trade a decade later.) 1904 A large vintage: full amber-brown, rich molasses nose, smoky and rich, thicker and sweeter than the 1908, still very much there. To 2024. 17. 1896 Declared by all shippers at that time: deep red-amber (incredible to have a touch of red at 116 years old! ), good lively fruit, both supple and rich with wonderful middle sweet- ness. To 2020. 18. These tasting notes were commissioned by Decanter.